Think of it as your final wedding responsibility. Here, answers about thanking your guests properly. 1. What should we write in our thank-you notes? 2. How much time do we have to send them out after the wedding? 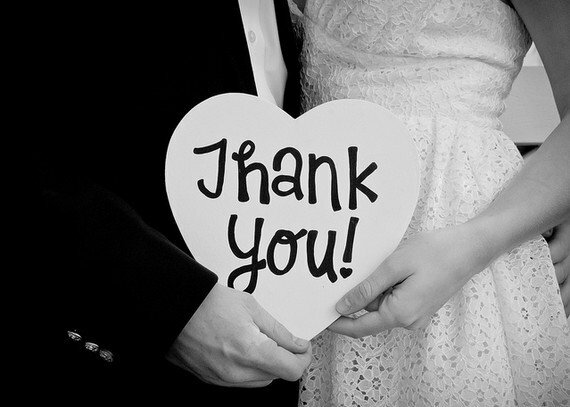 3. Who writes the thank-yous — bride or groom? 4. Do we need to send a thank-you to a guest who didn’t bring a gift? 5. Is it appropriate to send a thank-you with a preprinted message? 6. Should we send thank-you notes to our vendors? Have an etiquette question? Leave a comment below! My parents and my grandmother both contributed large amounts toward our wedding. What is a proper way to thank them, and when should the thank you occur? Is it okay to thank them along with our wedding day gifts, or should we send a thank you within a certain period of time after receiving the money?